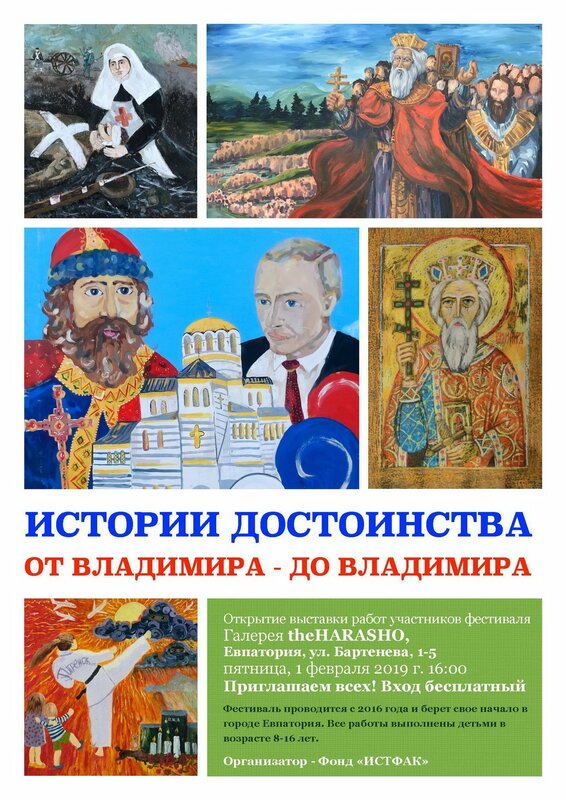 On February 1, the exhibition of works by the winners of the Youth Historical and Cultural Festival “Stories of Dignity. From Vladimir to Vladimir. ” The exhibition will be held in the framework of the events dedicated to the fifth anniversary of the return of the Crimea to Russia. The opening will be attended by State Duma deputy Svetlana Savchenko, authors of works, representatives of educational and cultural institutions, and public figures. The festival started in 2016 in Evpatoria, after which it passed through all the major cities of the Crimea and went beyond the peninsula. Nizhny Novgorod, Krasnodar and Omsk became the first cities of the mainland of Russia, which met this important historical and cultural event. On June 1, 2018, on Children’s Day, the grand opening of the exhibition of reproductions of works by participants of the Festival “Stories of dignity. From Vladimir to Vladimir ”in the Council of Federation of Russia. Galina Nikolayevna Karelova, Deputy Chairman of the Council of the Federation, delivered a welcoming speech. She highly appreciated the historical knowledge and creative abilities of the participating children, expressed gratitude to the organizers for their active citizenship and wished them further success in the development of the Festival. “It is no coincidence that the name contains two prominent personalities. The baptism of Russia became possible thanks to the will of Prince Vladimir and thanks to the will of Vladimir, the President, Russia is being reborn again, ”explained State Duma Deputy Svetlana Savchenko, who has been patronizing the Festival since its foundation. The festival is a lively fascinating process of involving young people and whole families in episodes of the history of their native country. His goal is the preservation and transmission of historical truth, the formation of a creative life position on the examples of "stories of dignity", which the chronicle of Russia is full of. In the process of creating large-format paintings on historical subjects, children thoroughly study the biographies of those individuals or historical events from national history to which their works are devoted. Vivid memories, supported by colorful photographs, will long remain in the memory of participants and spectators, illustrating important events in the life of the Motherland. New formats in the education and cultural enlightenment of children are an urgent need, without which it is extremely difficult to arouse interest in learning and prevent young people from falling into the sphere of their interests ideological garbage. Today, more than two thousand children took part in this project. Each of the paintings created by them bears a unique historical plot and is made with great enthusiasm and interest. At the end of the exhibition in Evpatoria, it will be presented in Kerch, and on March 18, the Day of the Crimean Spring, a new exposition will unfold again in the Federation Council in Moscow.